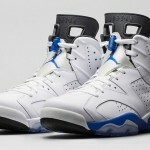 The original ‘Sport Blue’ Air Jordan 6 colorway is back for the first time, with an all-white leather upper and bold Sport Blue accents. 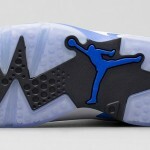 The Air Jordan 6 Retro features a visible Air-Sole unit in the heel, a lace toggle to keep your laces cinched tight and distinctive clear rubber outsole elements. If you’re interested in copping a pair this Saturday, please read our release details below. 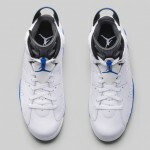 In partnership with mall management, SELECT House of Hoops by Foot Locker stores will implement a sweepstakes ticket procedure* in order to purchase the Air Jordan 6 Retro “Sport Blue” (on sale 8/30/14 for $ 170). The sweepstakes tickets will be given out Monday, August 25th and Tuesday, August 26th. If your ticket number is selected, you will be notified by phone on Wednesday, August 27th or Thursday, August 28th. These procedures are for SELECT STORES only. To find out which store near you will carry the shoe and if that store will implement the sweepstakes ticket procedure, please visit the Foot Locker Launch Locator. 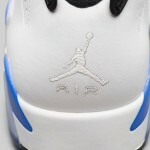 Full family kids sizes will also be available. 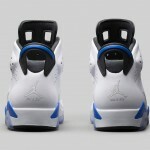 This release will be available in men’s and full family kids sizes starting at 8:00 a.m. EDT on Saturday, August 30th. Print article This entry was posted by hhcblog on August 24, 2014 at 8:25 am, and is filed under Footwear. Follow any responses to this post through RSS 2.0. You can leave a response or trackback from your own site.